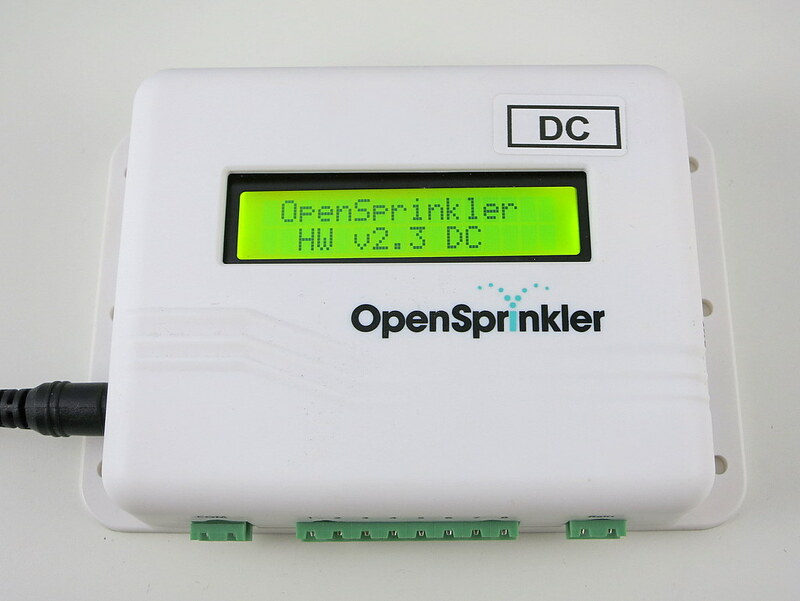 After several months of continued development, I am excited to announce the release of the first DC powered OpenSprinkler — v2.3 DC. This version uses a 9V DC universal power adapter, and is designed to work with both standard 24V AC sprinkler solenoids as well as DC (e.g. 12V DC) non-latching solenoids. Below are two pictures. Buy OpenSprinkler v2.3 DC from Rayshobby Shop. As explained in a previous blog post, the main motivation behind this is to make it easy to source the power supply for OpenSprinkler, particularly for International customers outside of US/Canada. As you know, different countries use different mains voltage standard. In US/Canada, the mains voltage is 110V AC; but in most other countries, the mains voltage is 220V to 240V AC. Because AC adapters are not regulated, you can’t directly use a 24V AC transformer designed for the US market in, say, Germany. You will either need a 220V to 110V step-down converter, or source your own 24V AC transformer. Either case, it’s a pain. On the contrary, DC transformers are much easier to source, and work universally in any country of the world. They are usually cheaper too, because their demand is higher than AC transformers. Therefore it would be ideal to use DC power supply. This is just like how your laptop adapters can work with any mains voltage in the world, so you don’t have to worry about it wherever you travel to. Given the above benefits of DC, why in the world are sprinkler solenoids designed to work on 24V AC? To explain this, you should read my earlier blog post entitled Understanding 24V AC Sprinkler Valves. In that blog post I analyzed the electrical properties of 24V AC solenoids. They generally require a high impulse (in-rush) current to get energized (often as high as 300 to 500mA), then they will stay on with a relatively low stable (holding) current (e.g. 150 to 250mA). With AC power, the solenoids can automatically achieve this dynamic current adaptation, thanks to the solenoid coils’ electric properties (technically, the inductor’s reactance to AC). This ensures the solenoid will both turn on solidly, and remain on at relatively low power consumption and heat dissipation. The circuit design is also quite simple and straightforward. But there is no reason why we can’t achieve the same effect with DC. Specifically, there is nothing particular about AC solenoids that they must be driven by AC — they work just fine under DC current. However, you need a more complex circuit to alternate the voltage: it needs to produce a high in-rush voltage to ensure the solenoids are solidly energized, and then reduce the voltage down to produce a relatively low (150 to 250mA) holding current. According to my calculation, 9V DC is ideal for providing the required holding current. On top of that, we just need a boost converter to generate a high in-rush voltage (18~22V) required to energize the solenoids. That’s it — this is how a DC powered OpenSprinkler works on a high level. If you search online, you can find plenty of people using just 12V DC to power sprinkler solenoids. In my mind, it’s not the most reliable design, as 12V is barely sufficient for producing the in-rush current, and is too much for holding current. As a result, it may not successfully energize the solenoids, and it certainly will shorten the solenoids’ lifetime due to the excessive holding current. That’s why my design uses 9V DC power instead, in conjunction with a on-board boost converter. This provides the optimal holding current as well as in-rush current. If you still have questions or confusions, hopefully the F.A.Q. below will help you answer your questions. How is OpenSprinkler v2.3 AC different from v2.3 DC? OpenSprinkler v2.3 AC uses 24V AC transformer (sold separately), and triacs to drive sprinkler solenoids. OpenSprinkler v2.3 DC uses 9V DC transformer (included in the package), and MOSFETs to drive solenoids. Other than these, the two use the same microcontroller (ATmega1284p) and run the same OpenSprinkler Unified Firmware. 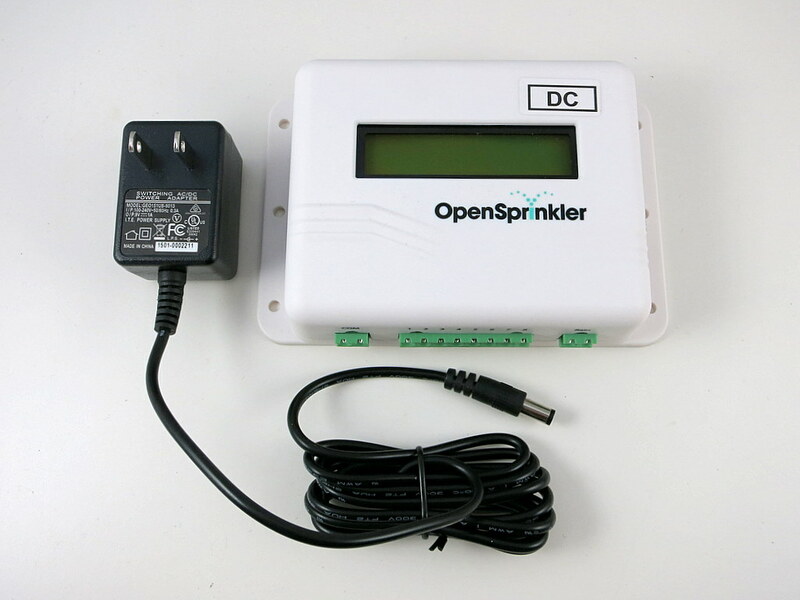 In addition, OpenSprinkler v2.3 DC includes a universal 9V DC power adapter that can be used worldwide. In contrast, v2.3 AC version does NOT include the transformer — US/Canada customers can purchase 24V AC transformer as an optional add-on, but customers in other countries will have to source 24V AC transformers on their own. What types of solenoid valves can work with v2.3 DC? Both standard 24V AC sprinkler solenoids as well as DC solenoids (e.g. 12V DC or 24V DC, non-latching type). Keep in mind that v2.3 DC is NOT compatible with latching solenoids. What about pump start relay and multiple valves? We’ve tested a few common pump start relays and they all work well with OpenSprinkler DC. We’ve also tested opening multiple valves simultaneously without any issue. How can I decide which version to get: AC or DC? We strongly recommend the DC version for anyone who doesn’t already have a 24V AC transformer, because the DC version includes the transformer. It’s particularly suitable for customers outside of US/Canada as there is no need to source your own power adapter any more. Also, if you need to control DC solenoid valves, such as 12V DC solenoids, the DC version is your only choice. On the other hand, if you need to use certain sensors that require 24V AC, such as wireless rain sensors, soil sensors, or solar sensors which require 24V AC, you are better off with the AC version as they can share the same 24V AC power supply. Does OpenSprinkler v2.3 DC output AC voltage? No, it does not. It uses completely DC voltage to drive AC sprinkler solenoids. To understand how it works, refer to the explanations above. Because the output voltage is DC, it can also work with DC solenoid valves (non-latching type). Keep in mind that the DC controller must use DC expansion boards; similarly, AC controller must use AC expansion boards. You should NOT mix and match the two, or your sprinkler solenoids won’t function properly. All DC controllers and DC expansion boards have the label [DC] attached at the front and back of the enclosure. What’s the operating voltage range for v2.3 DC? 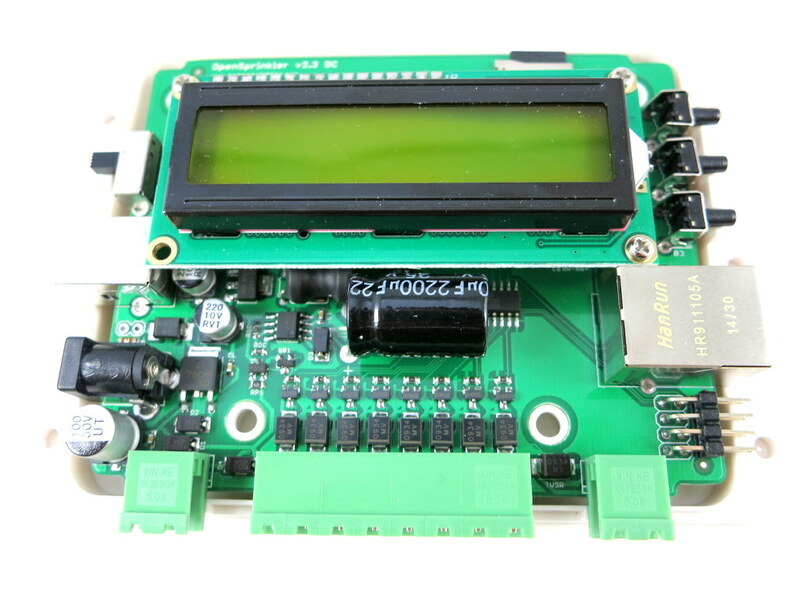 Although v2.3 DC comes with a 9V DC power adapter, you can power it with any voltage ranging from 5~24V DC. Can you give me more details on how v2.3 DC works internally? Below is a block diagram of the v2.3 DC circuit. All relevant parts are marked in red. The mcu controls two high-side switches (HS switches): it turns on switch 1 to engage the boost converter (based on MC34063), which generates 22V DC and stores that into a capacitor; it then turns off switch 1 but turns on switch 2 to dump the boosted voltage to the common (COM) wire, which provides the in-rush current. Finally it turns off switch 2 and the input 9V DC continues to provide the holding current through the diode. The snapshot below shows the inside of the controller. I’m interested in your V2.3 DC version of OpenSprinkler, and wondering when will you publish the schematic and related firmware changes to your github space? 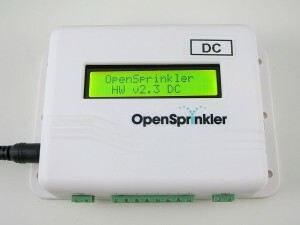 The current firmware (2.1.5) is compatible with both AC and DC versions of OpenSprinkler. It uses the signature byte stored in EEPROM to detect the specific version. 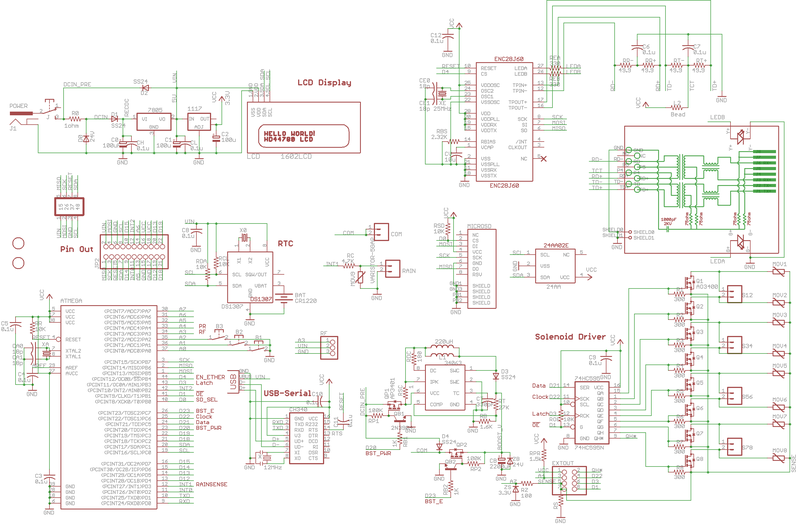 Regarding schematic, I will publish it as soon as we hear some feedback from the first batch. Good news for non-usa people! Any plan to add latching valves support? Why they are not compatible? Latching valves require H-bridges to operate, which are more complex than just using a MOSFET switch for non-latching valves. Great news 🙂 Begs the question though… is there an OSPi DC version in the pipeline? Yup, OSPi DC version is being planned and is in prototyping stage right now. Hey Ray – is the DC version compatible with the standard 0.5mm wire used for 24VAC installations? What are the longest cabling runs allowable? I want to run it from a stand-alone solar system, running at 12VDC. Hence the interest in the DC version. I take it we can just plug this straight in. Problem is I’ve already installed the cabling, as described above. I haven’t sourced the solenoids yet, so should I use standard 24VAC or (non-latching) 12VDC versions? Yes it’s compatible. The DC version is designed to supply the same amount of impulse current and holding current as AC controllers, so the standard for wire thickness if the same. I have the same question about using either 12vdc or 24vac solenoids. On solar power the overall power consumption is important, so any idea which would use the least power? I am thinking either 24vac valves running on 9vdc, or 12vdc valves running on either 9 or 12vdc. I have asked a similar question in the forums but no one seems to have much of an answer on this. According to my research, 9V DC is ideal for most 24V AC valves because that will generate the holding current suitable for most valves. 12V is a bit on the high side. Hey Ray – I would like to use a 12V (solar backed) battery as the power source (because there is no power point anywhere near). From your block diagram it seems that an input voltage of 12V-14.4V should not be problem for the 7805, but do you see a problem (e.g. mc34063 boost converter) ? 12V input is fine. 7805 can definitely handle it, and MC34063 can handle it too (it’s a boost converter so the input voltage is allowed to vary across a wide range, as long as it’s lower than the target voltage 22V). Will this controller work with the following valve? Maybe with some of this ones also? Yes, OpenSprinkler DC should be able to work with any of these 12VDC solenoid. Ray, What is the current demand on the board to open 4 valves at the same time? Would it be possible? Also, what pins are still available for other operations should I want to, such as adding a simple programming keypad or other way to select/operate the controller? Hi Andrew, generally opening 4 valves at the same time requires somewhere between 700mA to 1A current from the transformer. I would say if your transformer is rated at least 1 amp it should be ok. Minimum voltage or maximum? The controller can run on voltage as low as 5V (through USB). Generally the input voltage should roughly match the solenoid spec, for example, if you have a 12V DC solenoid, use 12V DC input voltage. In practice, due to the high impulse voltage produced by the boost converter, you can run solenoids on lower input voltage and it should still work well. I could not find what inductors are you using in the boost converter (34063) ? Only non-latching valves are supported by OpenSprinkler DC. You should check the datasheet / spec of the valve to see if it’s latching or non-latching. Usually latching valves have very low resistance (<10 ohm) and they require impulse (as opposed to sustained) voltage to open or close. I have a Rail Bird system which includes a Rain Bird ESP-SMT Controller. The system includes a 25.5 AC supply and a SMX rain sensor. I am interested in the Open Sprinkler system. Will my rain sensor work with the Open Sprinkler. What would be the benefits (if any) of the DC version as opposed to the AC version. Yes, OpenSprinkler has one sensor port that is by default configured for rain sensor (you can also configure it as flow sensor if you need). The AC controller is more classic. The DC controller is a newer design that is more flexible. For example, the DC controller is compatible with both common 24V AC sprinkler valves as well as 12V DC valves. It can run on a wide range of input voltage (as low as 5V DC through USB). This makes is versatile in terms of selecting the power source — you can either use the included 9V DC power adapter, or run it on USB power, or solar panel (12V), or car battery. In contrast, the AC controller can only run on 24V AC power adapter. Initially the DC controller was designed primarily to address international customers, who often find it difficult to source 24V AC power adapter. It’s difficult for us to source these adapters too, due to the fact that AC power adapters are not regulated, and different countries have different mains voltage standard. Over time, the DC controller has become a more popular choice even for customers in the US/Canada. I tried powering this from USB. The LCD screen lights up, but it doesn’t get any messages on the screen. The USB power supply is rated at 1000mA and I used the multimeter to show that there was definitely 5 volts being supplied. I was wondering whether you had any ideas what might be the problem. Yes, because the LCD requires 5V and when powering it through USB power, the LCD gets only about 4.3V (due to a diode drop). 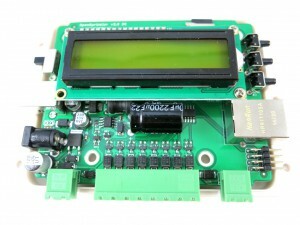 However, that’s just the LCD and it shouldn’t affect the microcontroller and the rest of the circuit. Yes it can drive solid state relays directly. I have a OS 2.1u its been great! MY question is this, What is the range of the DC Version? I would think using the same Wire the AC is going to travel much farther with less loss. I have many valves that are at the end of several 100 feet of Cat5 that work great is the DC going to be the same? The AC and DC versions have no difference in terms of the wire range.